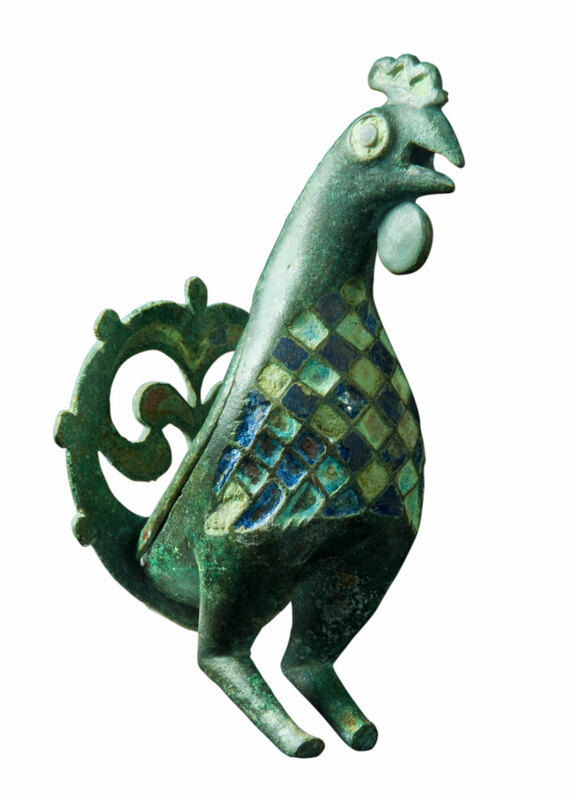 This exquisite enamelled bronze cockerel figurine was found by our archaeologists late in 2011 during excavations at the site of Cirencester’s western cemetery. The find is believed to date to the middle decades of the second century AD. It came from the grave of a child aged 2–3 years. The child had been buried in a nailed wooden coffin and also accompanied by his or her shoes, of which only the iron hobnails survived, and a pottery feeding cup or ‘tettine’. Only eight finds of this type are known from the Roman world, from Britain, Germany and the Low Countries. 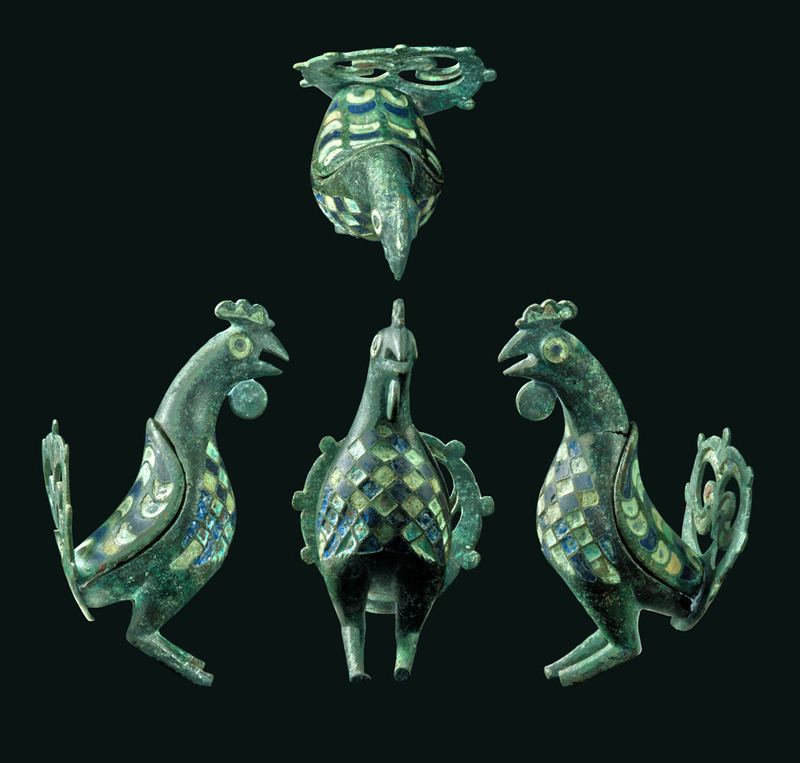 It is believed that cockerel figurines of this type, together with other richly-enamelled bronze vessels of high workmanship, were made in northern Britain and exported across the empire. 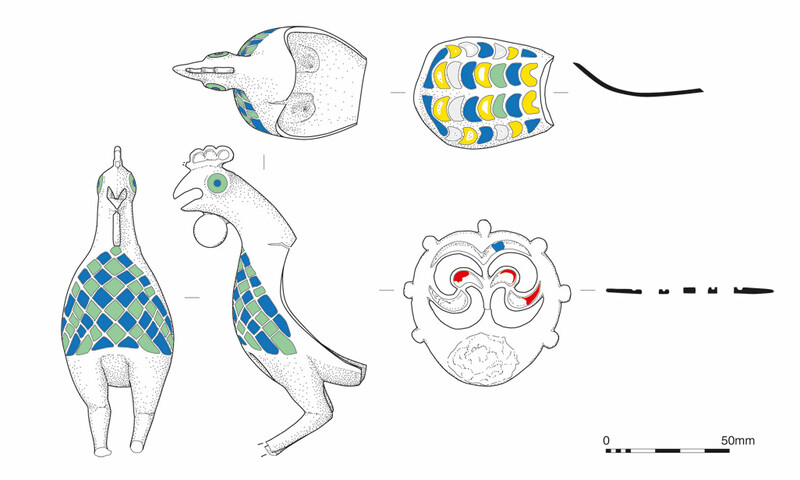 The Cirencester cockerel is the only example to have survived with its openwork tail and the only one from Britain from a grave. When first made it would have been extremely colourful, the metal bright, and the wings, breast, eyes and tail with a pattern of red, blue and yellow enamels. To the Romans the cockerel held a special significance, linked as it is to the cult of Mercury. This association is thought to relate to Mercury’s role as a messenger to the gods and the cockerel announcing each new dawn. Surviving statues of Mercury, including an example from Cirencester, commonly feature a cockerel at the foot of the god. Mercury’s role as herdsman for the dead, accompanying the souls of the recently dead to the afterlife, may help to explain the presence of the Cirencester cockerel in a grave – an expression of a bereaved parent’s concern to ensure a safe journey. The Cirencester cockerel has been on display at Corinium Museum since September 2014.